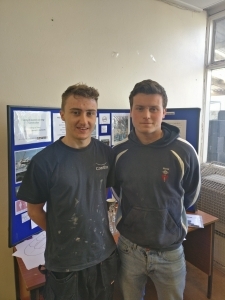 Helston Community College in Cornwall invited two alumni apprentices to speak to Year 12 Construction students in a session designed to boost motivation. Elliot Childs and Jack Noy talked to students about the realities of carrying out an apprenticeship. The session was one of a series of events taking place for Future First’s Back to School Week South West. Elliot Childs is an apprentice staff plumber at Coastline Housing and Jack Noy is an apprentice agricultural contractor. Both former students told students they had chosen the apprenticeship route because they could earn money while learning. Elliot explained the realities of the job, saying that although his apprenticeship is hard work, it’s also very rewarding. He also told students that he sometimes wondered whether he had chosen the right route but that perseverance and hard work allows him to focus on the light at the end of the tunnel.